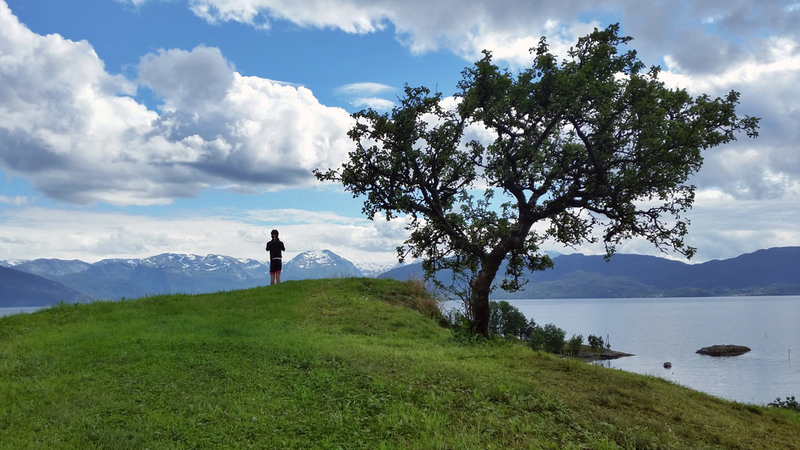 The man who ran the hotel in Kinsarvik was a mountain biker, but he understood cycling as a whole; the bliss of the journey, the enjoyment of pedaling, the thrill of speed. The biggest downfall to road cycling is the necessity of sharing the road with cars, but our hotelier had a solution. 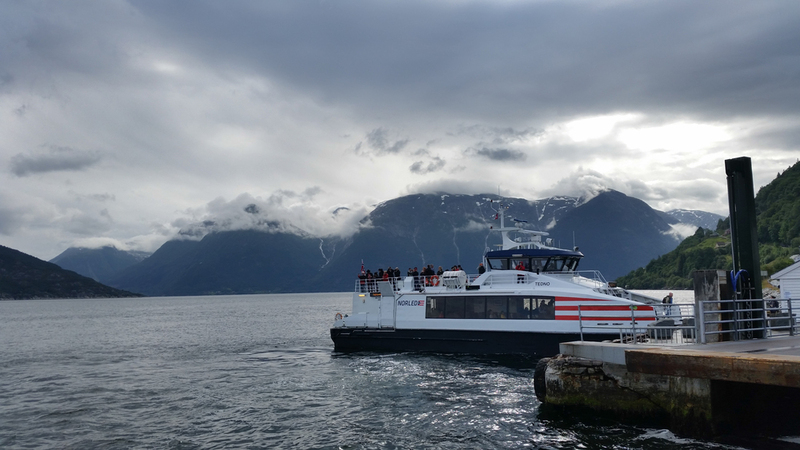 If we were to start our day with a ferry ride across the fjord, most of the day's journey would be on much smaller roads with m much less traffic. As always, little trumps local knowledge. We weren't prepared for how good his suggestion was. The ferry took us to an island with scenery nearly as beautiful as the girl working the tourism office. If I ever run away in pursuit of a Norwegian's love, this is where it will be. 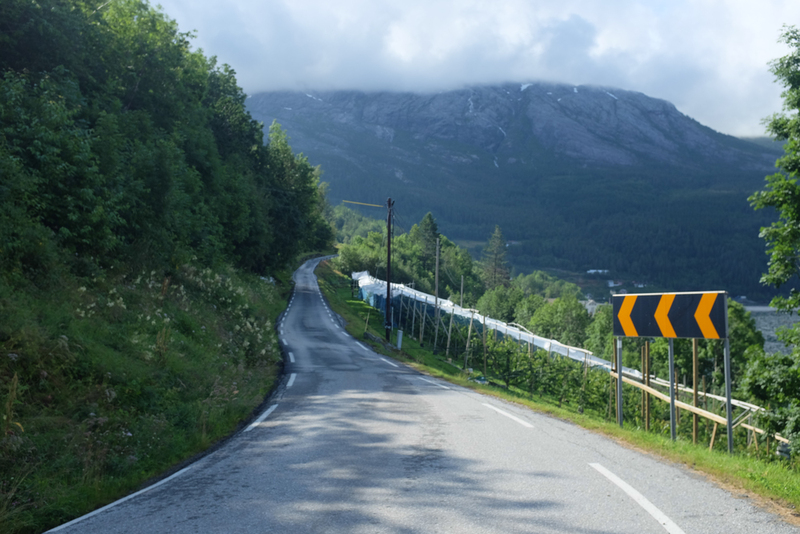 Lush green hillsides covered the island, with an endless expanse of fjord on the other side of the road. Right off the road were endless expanses of cherry trees, while snow mountains loomed eagerly in the distance. We stopped for cherries in between rolling hills and villages complete with red barns. Riding in the Fjord lands is a mix of intensity and chill. You ride for an hour or two before you must take a ferry to the next bit of land. We took three or four ferries that day, or forced rest stops as we considered them. Occasionally, there'd be a ferry that we knew we want to catch, so we'd hammer. Other times we'd amble along and eat while we waited for the next ferry. It was a good way to break up the ride with either option. We didn't have the best weather all day, though the grey skies and tumultuous clouds give the land an air of intensity that they greatly deserve. Grey, green and blue makes for a pleasing color palette, and the temperatures weren't low enough for true cold, so we were ok. Plus, clouds are always cool. That said, I like every ride to end in the sun, and this ride did just that. Our last couple of miles the sun poked his great orange head out of the clouds, illuminating all and warming every bone in our bodies. It is joyous to end the ride so peacefully, and to celebrate we bought beers and thai food and lounged on the dock for hours. With the sun shining on such a beautiful place, with family and beer, you can't go wrong.